In a "hard Brexit," Britain just leaves and all EU regulations, etc. are null and void. It's pretty clear cut. A "soft Brexit" can mean almost anything that is not a "hard Brexit"; i.e., Britain would agree to continue some or all of the manufacturing regulations, tariffs, and intergovernmental agreements — such as ceding jurisdiction to the European Court of Justice — that apply to EU countries. The list is almost endless and the time frame very nebulous, a perfect playground for those who wish to have a Brexit In Name Only. If there is to be Brexit of any sort, however, Parliament must act. Experts in British constitutional law claim that only Parliament can actually take Britain out of the EU and only Parliament can decide under what terms, if any, it will do so. Of course, one of the terms of separation could be that there are no terms of separation — thus, a "hard Brexit." The current government has been exploring the possibility of dropping all import tariffs to zero except on "sensitive industries". This would be very good for consumers, because the EU imposes tariffs on almost all imports from nations not in the EU itself. Most notably in its attempt to insulate inefficient European farms from worldwide competition, the EU imposes onerous tariffs on non-EU agricultural products via the Common Agricultural Policy (CAP). Eliminating these and many other tariffs would significantly lower the cost of living for the British people. The success of Brexit may depend entirely on whether Britain does in fact eliminate tariffs on most goods. It is a golden opportunity. The EU itself is very export oriented, so it is unlikely that it would impose any restrictions on member countries selling goods to Britain. So far so good! Exports are another matter entirely. No longer in the tariff free customs union, it is assumed that the EU would impose tariffs on British products as it does on any other non-EU country, raising their cost to EU buyers, which one must assume would result in fewer British sales. The real harm would not fall on British exporters but on Britain's EU customers, who now are forcibly prohibited from buying British goods at the previously advantageous price. On the other hand since it no longer must meet onerous EU manufacturing regulations, British industry might enjoy lower manufacturing costs which would enable it to sell more to non-EU countries. Although it might take time for Britain to develop new markets for its goods, some countries, led by the U.S. itself, have stated that they are ready to sign free trade agreements with Britain as soon as it leaves the EU. The City of London is a massive global hub. Its banking and insurance companies are dominant in the EU and likely to remain so for reasons of depth of market knowledge and a high reputation for honesty and fair dealing. Although some companies have moved some operations to Frankfurt, it is unclear if these moves are significant in number and may be simply part of normal market flux. 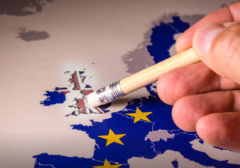 The same fears about the fate of the City were raised when Britain secured an opt-out from the 1992 Maastricht Treaty which formally created the euro. Unless the EU imposes some special tax or regulation prohibiting EU members from utilizing London firms, it is unlikely that the City will be much affected by a "hard Brexit". Uncontrolled illegal Immigration into the EU became a key issue for passing the Brexit referendum. There had been much concern for decades over loss of British sovereignty to unelected bureaucrats in Brussels and the economic cost of belonging to a closed customs union with high tariffs and onerous regulations, but the movement to leave came to a head over border controls or lack thereof. One of the four pillars of the EU is freedom of movement of people within the EU. (The other three were freedom of movement for goods, services, and capital.) Illegal immigration came to a head following the crisis of refugees from the Arab world. Once inside the EU, these refugees could migrate anywhere within the bloc, including Britain, raising the cost of providing social services and disrupting settled life. Britain was not the only EU country that opposed this unforeseen migration. In fact immigration control may yet break apart the EU, as the elite in Brussels insist that every EU country not only accept a dictated number of refugees but also that every country then allow refugees to migrate freely within the EU. A "hard Brexit" would remove the requirement that Britain accept more refugees than it believes it can assimilate. Uncontrolled border crossings would end as modest checkpoints are reinstated. A separate border issue pertains to the relationship between Northern Ireland and the Republic of Ireland over goods. Northern Ireland is part of the United Kingdom of Great Britain and Northern Ireland and there has been much concern over continuing the free flow of goods into and out of the Republic of Ireland. This seems to be much ado about little. Most probably goods to and from the Republic of Ireland would be subject to random checks with very little hindrance on trade. The EU has lobbied for an "Irish backstop", whereby Northern Ireland would remain in the EU for some period of time. Naturally this has incensed loyal British subjects, especially in Northern Ireland, and has almost no chance of being part of a "soft Brexit" deal. In conclusion the effect of a "hard Brexit" on Britain itself should be overwhelmingly positive, especially if Britain does in fact remove all tariffs and conclude free trade pacts with the rest of the world fairly quickly. Naturally my advice to Britain is to unilaterally remove all tariffs on all goods, including "sensitive industries." Free trade deals then become irrelevant. Britain could lead the way in showing the world the benefits of unilateral free trade, just as it did in the nineteenth century with the abolition of the Corn Laws. Perhaps this outcome is what the EU fears the most, because it would call into question the benefit of belonging to a closed customs union and would spell the end of the EU itself.